Boldface type indicates specific statins and doses that were evaluated in RCTs. All of these RCTs demonstrated a reduction in major cardiovascular events. Italic type indicates statins and doses that have been approved by the FDA but were not tested in the RCTs reviewed. BID indicates twice daily; FDA, Food and Drug Administration; LDL-C, low-density lipoprotein cholesterol; and RCTs, randomized controlled trials. Individual responses to statin therapy varied in the RCTs and should be expected to vary in clinical practice. There might be a biological basis for a less-than-average response. †Evidence from 1 RCT only: down-titration if unable to tolerate atorvastatin 80 mg in the IDEAL (Incremental Decrease through Aggressive Lipid Lowering) study. 1) Stone NJ, Robinson JG, Lichtenstein AH, et al. 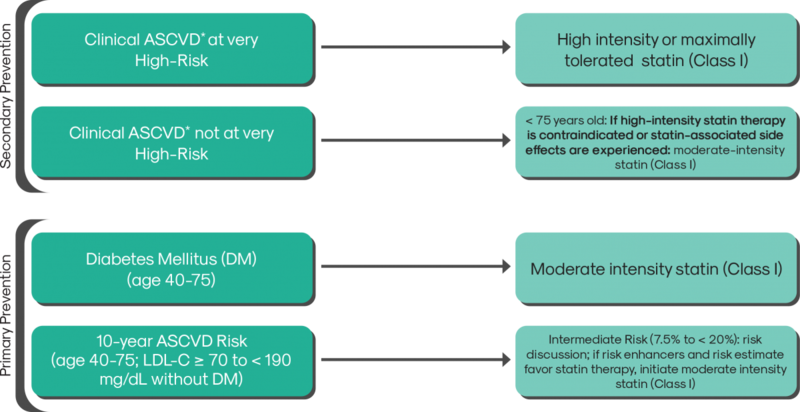 2013 ACC/AHA guideline on the treatment of blood cholesterol to reduce atherosclerotic cardiovascular risk in adults: a report of the American College of Cardiology/American Heart Association Task Force on Practice Guidelines. Circulation. 2014;129(25 suppl 2):S13. 2) ZOCOR [prescribing information]. Whitehouse Station, NJ; Merck & Co., Inc.; February 2018.